The Canadian Embassy, the only embassy on Pennsylvania Avenue has a new neighbor. CLARK construction who built the difficult Embassy building a few years ago is installing next door the support of excavation for a deep excavation in soft clays that will house the new Freedom Forum and Newseum. Turner Construction is the construction manager and Schnabel Engineering the foundation consultant. 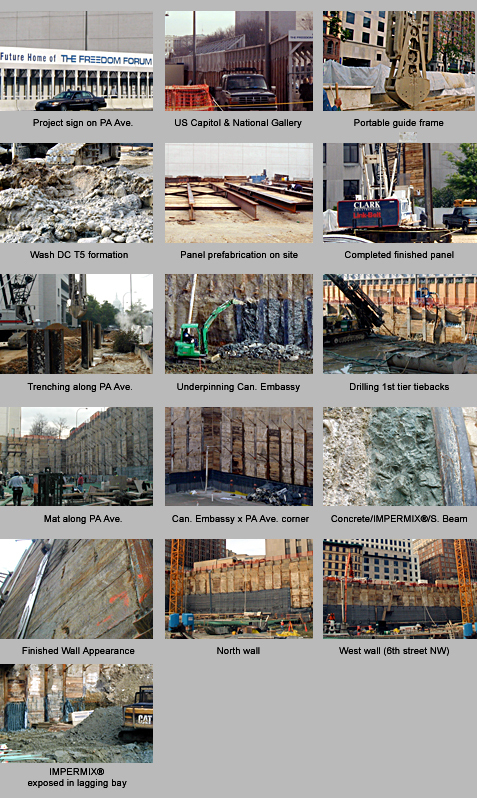 Originally designed by Schnabel as a deep soil mixing wall because of the concern for ground movement in the soft clays, CLARK FOUNDATIONS with its extensive experience and knowledge of downtown Washington DC soils, redesigned the support of excavation as what it calls a Soldier Beam Self Hardening Slurry, SBSHS for short. This shoring method was initiated in 1993 by the former George Hyman Construction Co (now CLARK) in Baltimore at the Shot Tower Metro Station, when the idea of installing a soldier beam and lagging system in saturated soils came to Alan Hobelman, Hyman's foundation division head. This was made possible by combining two usually separate techniques: a) cutoff wall construction by trenching under a self-hardening slurry as a one phase construction method and b) soldier beams and lagging support of excavation, where pre-assembled panels of various soldier beams laced together and lagged with timber, steel plate, pre-cast concrete panels or nothing are lowered in the fresh slurry and hung until the latter sets and strengthens sufficiently to carry the panel's weight. Contrary to a concrete slurry wall that requires a two phase construction approach, guide walls, stop end forms to create panel boundaries, eventual repairs of leaky joints and surface grinding of excessive irregularities, a self-hardening slurry trench does not require guide walls and is built with a slow setting slurry (IMPERMIX®) that allows a jointless perimetral cutoff wall that is the best waterproofing possible. Because of the relative economy, the cutoff wall is lowered to the aquitard level to create a perfect bathtub. Laced soldier beam panels are fabricated flat on the ground where the installation of pre-cut timber lagging is extremely simple and cost effective. Both soldier beams and lagging are designed for hydrostatic pressure and various lagging thickness are used when necessary. With successive panels hanging plumb in fresh slurry, the alignment is provided by the surveyor's line of sight and a perfectly flat back form is provided for the permanent cast in place foundation concrete wall. Soldier beams may be integrated in the wall design by attaching Nelson studs or similar to the flange in contact with the wall. CLARK FOUNDATIONS designed a judicious tieback reservation centered on the soldier beam's web so that no whalers were required to brace the wall and anchor seats were directly attached to the soldier beams. This lead to a clean looking shoring that was appreciated by both the excavation and the concrete formwork subcontractors. Leakage through the cutoff wall perforation were controlled in a similar fashion as for slurry walls by secondary grouting. The shoring wall was installed over a period of two months with the use of one single clamshell rig operated by a veteran CLARK slurry trenching crane operator, the IMPERMIX® slurry being produced on site by an in house mixing plant. The slurry used being one of the end products, no waste slurry has to be removed offsite; the excavation materials being partially mixed with the self-hardening slurry will become cohesive and will have no problem being landfilled by comparison to bentonite slurry tainted soils.